Superman, having been corrupted by the "evil" solar energy of Apokolips, returns to Earth and finds himself in battle before he can enter the atmosphere. He dispatches the foe easily, then flies off for pie, of all things. Melvin's Diner, an establishment Superman frequents, is his destination, and he proceeds to do his best Superman III imitation, while demanding pie. Meanwhile, a dark substance is spreading through Metropolis, and enveloping everything in its path. Superman doesn't care, being evil now, so he ignores Jimmy Olsen's imploring him to help. It isn't until he's alone that Superman has a change of heart, and saves the city, prompted by the sole living thing leaving him, a stray pigeon. Superman leaves after freeing the city, realizing that he needs help, though where he goes to find it is unknown. Story - 2: The premise of the story is fine, but the execution is painfully poor. If there is one thing a reader can take from Manapul's efforts, or even learn from them, is how deeply ingrained a character like Superman is in the mind of a creator, and perhaps the public at large. Perry White is portrayed as a sensationalist driven editor, which is out of character for him; Jimmy Olsen is returned to his classic lovable nerd. However, Superman is sought to be portrayed as Metropolis' hero, who is a constant facet of the day, right down to its news. 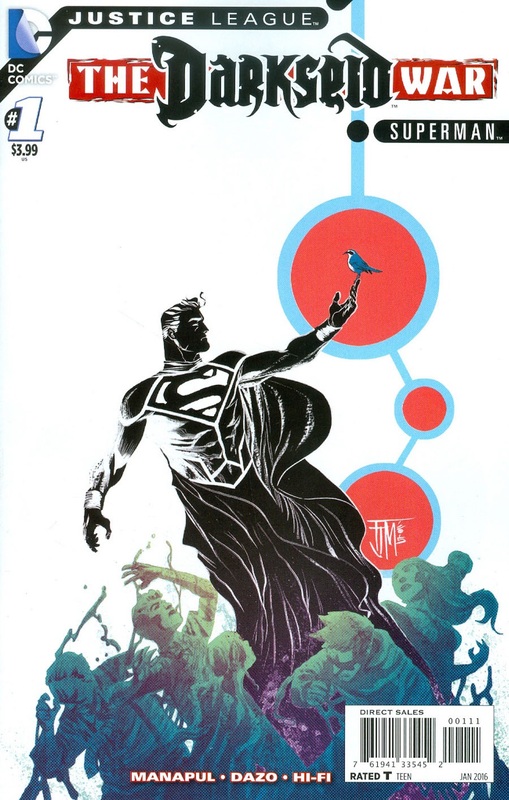 Manapul relies on the core elements of the Superman mythos and cast for the story, and it might have been efficacious if the core elements were elsewhere besides this tale. In Superman and Action Comics, Superman has been unequivocally rejected by Metropolis and slapped by Perry White. The city considers him as much of a problem, as the would-be invader is here. One could allow for divergent storylines, but at no time has Superman every been shown to be fully embraced by the people of the city he protects. The idea was to make him distrusted and skeptical in the minds of the people, in attempt at the trite notion of "returning him to his golden age roots". It didn't take, and now, in an issue such as this, it's more than discordant, it's doltish. Manapul gives readers a Superman who is evil, for all intents and purposes, just "not that evil," so he can still be palatable for the duration of the story. Superman doesn't fight the invader to save anyone, but to ensure his "rep". The sequences where he demands pie are risible, as they have no bearing on the story at all. "Pie, pie, pie!" but no connection to his desire for the dessert until Jimmy makes the loosest one possible. No family meals, no date with Lana, nothing, just "Pie!" It isn't until Superman is alone, something he desires in the most Incredible way, like jade giant hunted and hounded by those ever out to bust him, it's only then that he craves companionship, moving him to save the city. The sentiment, the idea is fine, but there has been so much lost with Superman over the last five years, that Manapul's slapdash execution almost seems apropos. It's a telling thing, how Manapul chooses to portray what Superman means to Metropolis through the people, Perry, and Jimmy, at least, what he should mean to the people, while the people mean nothing to Superman. It's a core element of Superman's character, but even here, he doesn't care very much, if at all. I never get to see more than a glimpse of the Man of Tomorrow, and that's an occurrence that's not limited to this one-shot. I never believe that Superman cares about anyone other than himself, and a piece of inanimate pie, and for the story to work, you have to believe that he cares. That's a hard feat to pull off when so much has been done to show that he really doesn't give a damn. Art - 4: Bond Dazo's rendering of Superman's negative state is extremely eye-catching. The splash of Superman decking the armored alien, is a roust, voluptuous sight, exceeded only by the image of Superman's blue eyes piercing the darkness that has encompassed him. Cover Art - 2: Bong Dazo should have had a go at this as well.